The Trout Creek target in the Reese River Valley area south of Battle Mountain, Lander County, Nevada, was staked by Thunder Mountain in 2007. 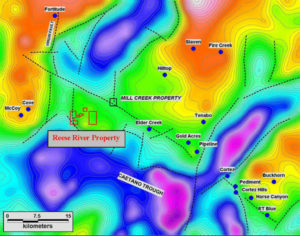 The target consists of a total of 60 unpatented lode mining claims, and is defined by a regional gravity high-low flexure and also by a magnetic anomaly confirmed through ground magnetic survey initiated by the Thunder Mountain during the summer of 2007. The anomaly is located in the pediment of the Shoshone Range and is covered by what is interpreted to be fairly shallow alluvial fan deposits. Trout Creek is located on an important trend with Newmont’s Phoenix Mine and the Gold Acres, Pipeline, and Cortez Mine lie to the southeast.